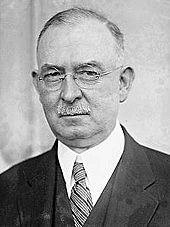 Today in Masonic History William Evans Crow is born 1870. William Evans Crow was an American politician. Crow was born on March 10th, 1870 in German Township, Fayette County, Pennsylvania. He attended public schools in the area before going on to a college education at the Southwestern State Normal School, also known as a teachers college, graduating in 1890. He also attended Waynesburg College. After graduating, Crown started working for a newspaper publisher. He worked there for three years while he studied the law. In 1895 he passed the bar and opened a private practice in Uniontown, Pennsylvania. In 1896, Crow was appointed assistant district attorney. In 1898 he was elected District Attorney of the 8th District of Philadelphia, Pennsylvania. The 8th District is the largest prosecutor office in Pennsylvania. He served as District Attorney until 1907 when he was elected to the Pennsylvania State Senate. He served in the state senate until 1921. During his time in the State Senate he served as President Pro Tempore of the Senate. In 1921, Crow was appointed to fill the vacancy created by the passing of Philander Knox, a sitting United States Senator. Crow resigned from the State Senate and immediately began his appointed term as United States Senator. Crown was never able to get a term of his own, he passed away just under a year later on August 2nd, 1922. Crow was a member of Fayette Lodge No. 228 in Uniontown, Pennsylvania.